Interested in being involved with the Remembering Sam Ford annual fundraiser? Please contact us at rememberingsamford@yahoo.com or call Marni at 805.748.8636. Samantha Michelle Ford of Arroyo Grande, California passed away in May 2010 at the age of 24 after her third battle with cancer. Sam was a dancer, artist, and performing arts teacher, despite losing her leg to her first bout with cancer at age 13. To honor her memory and continue her inspirational legacy, her friends and family have started the annual Remembering Sam Ford fundraiser. Proceeds will create yearly scholarships in Sam’s name for young dancers at The Studio of Performing Arts in Grover Beach, Sam's childhood dance studio. In addition, proceeds will be donated to The Pablove Foundation, which funds pediatric cancer research and advances in treatment, educates and empowers cancer families, and improves the quality of life for children living with cancer through hospital play, music, and arts programs. 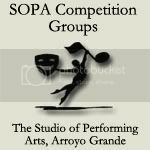 Remembering Sam Ford dance scholarships will be presented to SOPA Competition Group dancers at The Studio of Performing Arts. Proceeds will also be donated to The Pablove Foundation, which funds pediatric cancer research and advances in treatment, educates and empowers cancer families, and improves the quality of life for children living with cancer through hospital play, music, and arts programs. Peruse Remembering Sam Ford goodies like T-shirts, tank tops, tote bags, and bracelets.